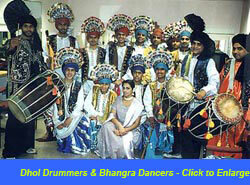 We have wonderful Dhol Drummers and Bhangra Dancers we can book for your event nationwide. 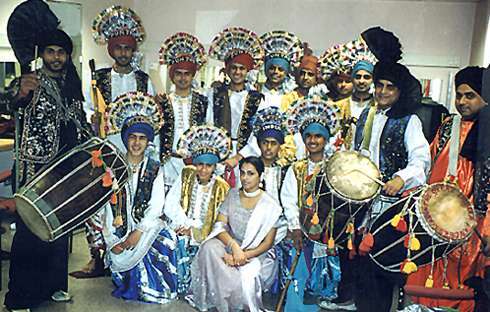 These are Indian drummers who may also be accompanied by dance groups who perform colourful and exciting harvest folk dances from the Punjab. Our groups are the very finest in the land as acclaimed from within their own communities and have performed at national and international events such as the opening ceremony at the Commonwealth Games in 2002 in Edmonton and a wide variety of rock and World Music festivals including Womad and Glastonbury. They’re also very experienced at performing at corporate events and have appeared on both local and national television. Many of them have worked alongside Local Education Authorities and have a lot of know-how in organising workshops for children and have been involved in ‘team-building’ events for our corporate clients, too.